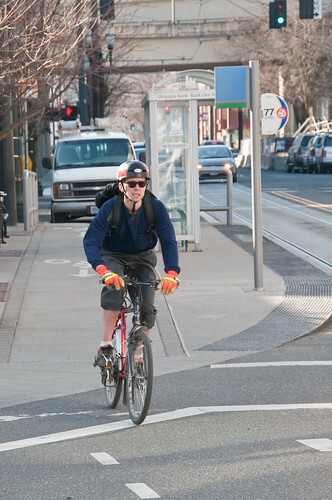 Due to the high response of great ideas to recent RTH articles discussing the Shifting Gears bike plan update here in Hamilton, I thought I'd post a short, two-page photo tour I found on bike transportation initiatives in Portland, Oregon. Having recently been there, I was impressed with the signage, parking, stop light box waiting areas and sheer number of bike lanes and facilities in the city. This tour does a good job at showing off the bike culture that has taken hold in this rainy west coast city. It's also important to point out the relatively low cost of initiatives such as the ones shown here. If Hamilton would ever commit half a million or a million dollars in one-time bicycle funding and look to earn matching funds from the province or feds, we could quickly transform the way this city operates and functions as it relates to bike transportation. Cycling infrastructure: what an inexpensive way for Hamilton to distinguish itself as a city where a high quality of life is available. Too much focus is put on attracting capital. Attract the skilled workers with a high quality of life and the capital will follow. Like I keep arguing: Hamilton has the legacy of pre-WWII planning, unlike other nearby municipalities. Why not leverage that value with innovative transportation projects insead of eviscerating it with sprawl and the suburbanization of downtown? Jason, the title of your post is " Portland Bike Infrastructure: Effective and Affordable", what evidence do you provide to back up this statement besides a photo tour or "Having recently been there..."? Where is the cost-benefit analysis to back up this claim? Please stop pulling stuff out of your a$$. Wah wah wah I'm a crybaby who needs to be spoon fed and who's afraid to do any research whatever because I might have to change my mind about something. Whatever you do, don't learn anythinga bout Amsterdam, Copenhagen, Portland, Trondheim, or any other city that has boosted cycling with inexpensive bike lanes. Crapitalist, you do realize that our economy is supposed to move forward, right? China has figured this out and that's why their switching from bikes to cars. What's next, giving up agriculture so we can go back to hunting and gathering? you do realize that our economy is supposed to move forward, right? actually, i am beginning to question this. why is it so important for the economy to always get bigger and bigger? what does this accomplish beyond allowing us to increase our consumption? i would rather quality of life increases. Speaking of moving forward, the bicycle is an industrial product invented around the same time as the automobile and has advanced steadily in technical sophistication, a trend toward higher bicycle use is entirely consistent with a worldview that defines "moving forward" in terms of technological advance. It is also entirely consistent with a more strictly economic worldview that defines "moving forward" in terms of rising efficiency and productivity. It is also nonpolluting, outside of its original manufacture and miniscule wear on the tires and brake pads. For urbanists, the bicycle supports community development, is consistent with dense, walkable neighbourhoods and consumes a much smaller land area footprint than the automobile. For public health advocates, regular bicycle use increases life expectancy by several years and is associated with significantly lower levels of heart disease, cancer, diabetes, and obesity. 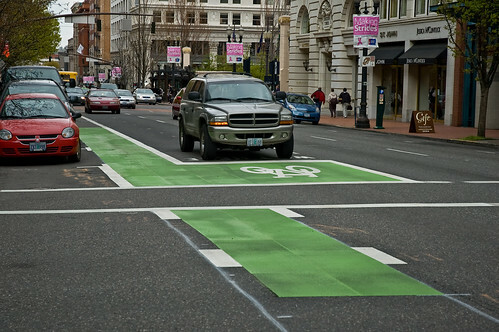 For drivers, bicycles take up much less space on the road than cars and can reduce traffic, especially when located on dedicated bike lanes. China's starting to switch to cars and guess what? Transportation is getting more difficult. As the international press has been reporting, the wealthier Chinese cities are already choked with cars, even though only a minority drive them. Is this progress? When it's more difficult and costly to get around? When you can't breath the air in your city? The official embrace of mass motoring by Communist China busts the myth that cars = freedom. China is not a very free place compared to Holland or Denmark, where cycling is growing dramatically. When I think of progress in transportation, I don't think of mindless speed. I want the utility of travel without the degradation of my surroundings. I want freedom of choice. I want to be able to rent/borrow a car when it suits me (car share co-ops are preferable). I don't want to have car ownership mandated by some totalitarian industrial regime that's reflected in poor urban planning. I think the embrace of bicycles by northern Europe is precisely because of their technological advanced stage. They recognize the post-fordist reality a little better. In short, they realize the 1950's are over. If road travel was not free, then traffic could be eliminated. Traffic jams only occur when there is too much demand relative to supply. Thank the government for that, not the automobile. China is in the process of becoming more free every day, at least economically, if not politically. Denmark is free politically, but government spending comprises 51.5% of overall output, hardly a bastion of freedom. >> I want the utility of travel without the degradation of my surroundings. What surroundings are being degraded? I used to live in a very rural part of the province and I almost never saw any wildlife at all. When I moved to the Scarborough bluffs, I saw coyotes, all manner of strange looking rodents, big and small and deer. How do you explain that? >> I don't want to have car ownership mandated by some totalitarian industrial regime that's reflected in poor urban planning. Oh the humanity, the government is forcing me to own a car! Maybe they'll force me to own a big house as well, bastards! >> I think the embrace of bicycles by northern Europe is precisely because of their technological advanced stage. I think it has more to do with their $9.31 a gallon gas (Denmark). Oh the humanity, the government is forcing me to own a car! In your model of increasing freedom, the government really is forcing people to own a car, in part by banning bicycles from city streets in municipalities where the government is trying to enforce car ownership. From time to time the mask slips off your fair weather libertarianism. If bikes could ride the speed of car traffic, then I don't see why they should be banned. However, if they are causing a traffic impediment, due to their slower speed, isn't that a real cause for concern? I am not in favour of stupid laws banning anything, but to me, it seems to be a safety issue. Please correct me if I am missing something. Do you ever notice you use the word "free" in two exactly opposite ways? In common, everyday language, a good is "free" if everybody has access to it. You can theorize about capitalism = freedom all you want, but the proof is in the pudding. All kinds of repressive states have had market economies. More importantly, the capitalist social relations are themselves demonstrably repressive. If road travel was not free, then traffic could be eliminated. Give it up. Nobody wants this, especially actual capitalists. Maybe freeways will be tolled, but only to cost externalities. But the city streets will always belong to the citizens. Denmark is free politically, but government spending comprises 51.5% of overall output, hardly a bastion of freedom. But Denmark IS a bastion of freedom! People enjoy a high degree of civil liberties there, despite the high level of taxation, and in part because of the use-values that the government revenues purchase. Maybe the taxes are high BECAUSE people have a lot of opportunities to participate and thus POLITICALLY DEMAND what they want out of life. Maybe taxes are spent with a high degree of sensitivity to local needs because of democratic participation. China is in the process of becoming more free every day, at least economically, if not politically. A place where labour unions are repressed with state violence is not an economically free place to me. And I'm sure consumer activism is highly curtailed also. But that's just my working class perspective. We're only like, uh, the vast majority of people. What surroundings are being degraded? I value life over speed. So I value ecosystems, parks, farms, buildings over parking lots, wide lanes, gas stations, pollution. So in general, mass motoring is degrading the landscape. I don't think this is entirely subjective. It's not the ownership that's the problem. It's the hours that are worked to maintain that ownership. It adds insult to injury that most of the use of the auto consists of getting to work. I follow in the autonomist tradition in that I think of ever increasing commutes as unpaid work. Mass motoring = longer workweek. LL >> Do you ever notice you use the word "free" in two exactly opposite ways? A "free" market economy is one in which people get to spend what they earn, rather than by politicians. "Free" goods, only exist because government doesn't have to pay for the goods it provides. >> the city streets will always belong to the citizens. Fine, but unless you can reduce demand, you will always have traffic jams. The same thing happens whenever government tries to give anything away for free, whether that is health care, or when using price controls. Unless you can find a way to stimulate additional supply, which is what profits do, you will be left with shortages. See the economic history of the U.S.S.R or pre Deng Xiaoping China, or Cuba for further details. >> But Denmark IS a bastion of freedom! Denmark's government spending accounts for over 50% of their economy and they have averaged 2% real GDP growth from 2003-08. Singapore's government spends 14.4% of GDP and it has averaged 5.57% real GDP growth the last six years. So while the people of Denmark may enjoy riding bikes and a solid safety net, they will not enjoy the gains in real wealth that more market based economies do. Like I said, political freedom in China is very poor and we all know that unions are as much about politics as they are about the economy. >> I value ecosystems, parks, farms, buildings over parking lots, wide lanes, gas stations, pollution. When you phrase it like that, it's hard to argue with you. However, the driving culture is not just about parking lots and gas stations and exhaust fumes. Cars allow people to live within an urban area AND have access to the more wild areas of the continent. Without cars, you would be stuck in your home town, bored as hell. You would only have access to goods and services produced locally and your quality of life would be severely impacted. >> I follow in the autonomist tradition in that I think of ever increasing commutes as unpaid work. Your great-grandparents likely worked 13-15 hours a day. Mine were farmers and loggers and they would have loved to have access to a car, fumes or no fumes. So while you THINK you may not like the car culture, or long commutes, try moving to Northern Ontario and living off the land for a while. dad said "it's a short hop"
"too late" said mom "the kid's popped"
A Smith > Fine, but unless you can reduce demand, you will always have traffic jams. Hence the desire to shift some of the demand to cycling. Continual growth in this region of the world will not be accomodated without a huge amount of costly new road building. Transitioning some of that demand to other modes is critical for making efficient use of our resources and keeping tax levels reasonable. A Smith > Oh the humanity, the government is forcing me to own a car! Think of it from the business owner's perspective. If the cost of owning cars exceeds the cost of public transit by $6,000 per person, then an employer would naturally save money by being able to employ people that don't have cars. Without such alternatives, they need to pay sufficient wages so that every employee can afford to maintain and operate a car. Business thereby becomes more profitable, thanks to having public goods such as transit and bicycle infrastructure available. The viewpoint is not one of cars bad, bikes good...it's one of bringing the proper balance, and offering citizens the freedom to use other modes. This ability benefits society in addition to the economy. As things stand, the culture which puts cars first, above all other options is exacting massive costs on our society, not to mention the impacts on neighbourhoods and our social fabric in general. For an interesing view, check out this piece from the US...Why Conservatives Should Care About Public Transit. Like I say, the proof is in the pudding. Holland is one of the most libertarian places with regard to sexual freedom, drug laws, political participation, and many other facets of life. Denmark falls not to far behind. Singapore is a police state with draconian laws. It's not just a random corellation. Many of the most "free market" states are authoritarian in nature. That's because working people's demands can be repressed in the interests of capital. Clearly, you need to think a little deeper about what human freedom is. Incidentally, car ownership is taxed to death in Singapore. But like I say, that becomes necessary at a certain point in order to deal with the externalities of motoring. Yes, taxes are coercive. But so is the command structure of the capitalist system. Having a safety net and inclusive, "convivial" public infrastructure makes working people less dependent on this corporate command structure. In western Europe, the workweek has been getting shorter. Here it is getting longer, and I think that is partially to do with enforced car dependence, among other things. It's not just a random correlation. Many of the most "free market" states are authoritarian in nature. Laws and regulations are necessarily coercive, because a set of rules that applies equally to everyone is the only way to prevent devastating collective action problems. It seems to me that the most important thing is to ensure that citizens have an ongoing opportunity to shape the framework of laws and regulations under which we agree to live. I still love the irony of people with screen names like 'ASmith' and 'Capitalist' urging us all to follow the lead of communist China. Adam Smith would be proud. arienc >> Transitioning some of that demand to other modes is critical for making efficient use of our resources and keeping tax levels reasonable. If drivers had to pay for the use of roads, just as they have to pay for their cars, demand for roads would fall dramatically. It would also mean lower taxes for everyone and a fairer playing field for mass transit. Once again, government interference in the delivery of goods and services distorts consumer preferences and the result is shortages and inefficient use of taxpayers money. >> Business thereby becomes more profitable, thanks to having public goods such as transit and bicycle infrastructure available. If public transit provides a useful service to businesses, then why the need to have taxpayers subsidize it? The HSR was started as a private company, so why can't it return to private hands? If it truly does provide a benefit to society, it will earn profits just like McDonald's, Tim Horton's, the odd airline, etc. I agree, governments should get out of the road business. LL >> Singapore is a police state with draconian laws. And yet people flock there. Singapore has a low fertility rate (1.24 in 2004), but it's population grew an average of 2% from 2000 to 2008. In 2006, around 30% of the people there were foreign workers. Nobody forced those people to go to Singapore, they made that choice of their own free will. From 2004 to 2006, real government spending in Canada grew 8.2% and final domestic demand (strips out net exports which Canadians don't get to consume) grew at 9.43%. From 2006 to 2008, real government spending increased 11.7%, while final domestic demand only grew at 6.86%. The point is that when government takes a larger role in the economy (39.2% of GDP in 2004 to 43.3 in 2008), real wealth generation slows down. Therefore, if the Canadian people want government to provide lots of freebies, doesn't it make more sense to do so with a faster growing economy. For example, if government spending was capped at 30% of GDP, it could still provide lots of services, but it would be able to increase it's spending at much faster rates than it currently does, simply because the economic base would be growing much faster. The alternative is to choke off private investment by increasing the relative role of the government, thus slowing the tax revenues that government requires to pay for the health care and education that people want. Think of it like eating all of your food in the present and not saving any seeds for next years crop. Jason >> I still love the irony of people with screen names like 'ASmith' and 'Capitalist' urging us all to follow the lead of communist China. A Smith >> If drivers had to pay for the use of roads, just as they have to pay for their cars, demand for roads would fall dramatically. On this point I agree with you, however in our society which has decided that public roads are a valued entitlement, that idea is unlikely to go anywhere. Politicians are afraid to enact even the slightest hint of road pricing, even on highways like the RHVP. And how do you convince non-drivers to pay for roads at all? After all, they shop at stores and use services which were supplied using those same roads. Once again, government interference in the delivery of goods and services distorts consumer preferences and the result is shortages and inefficient use of taxpayers money. There are many circumstances where government "interference" brings efficiencies. For example, as a road user, I would only want to pay for the roads connecting my house, my workplace, and the businesses I patronize. You would likely only do the same. The grocery store that buys food from the farmer would only pay for the roads that their trucks use, and so on. We end up with millions of individual actors trying to compete for road services instead of one single co-ordinated process for building roads in the community. How do they all agree on where the roads go? I see no evidence that this is more efficient and helps build a society that functions. Interesting you bring up McDonald's and Tim Horton's. Imagine those businesses without the benefit of public road infrastructure! Would they have grown to the size and scale they are now? Highly doubtful. These companies have capitalized and profited on the automobile culture that we citizens have subsidized. Which explains why they are resistant to any change in the status quo. Same with the airlines...we have spent billions of public dollars on airport infrastructure so that airlines can operate. Flying to Cancun for less than two thousand dollars a seat would not be possible in a truly free-market economy. Although most still remain unprofitable, those few that have earned profits have taxpayers to thank for providing them the opportunity. What folks like myself are looking for, is more balance in what we choose to subsidize. Instead of subsidizing primarily road and air transportation, balance that out with more pedestrian, bicycle, mass transit and train travel. Two wrongs do not make a right. If you are against free roads because they lead to excessive driving, the same is true for public transit. In either case, transportation subsidies promote excessive road use and reduces the money people can spend on things they actually do value. >> We end up with millions of individual actors trying to compete for road services instead of one single co-ordinated process for building roads in the community. How do they all agree on where the roads go? Think about how many companies are involved in bringing you your food at the grocery store. Farmers, manufacturers, importers, wholesalers, retailers, transportation companies, packagers, etc. Does the government coordinate all of these companies with a central plan? No, they don't. And yet, there are almost never any food shortages and the quality of our food is excellent. This is because business increase the supply of goods that lead to higher profits. It is greed that tells businesses to give people more of what they value, not a centralized plan. Why would road delivery be any different? If a certain area of town had lots of demand for roads, companies would supply more lanes, because business chase profits. No central plan can assess consumer demand with the speed and accuracy that business profits can. All central plans are based on old information and incomplete consumer input. Profits are based on real time consumer demand, without the need for meetings or consultations that government has to use. >> Imagine those businesses without the benefit of public road infrastructure! It's quite likely they would be even bigger. If the economy had grown faster because of less capital destruction on things like subsidized roads, Hamilton might look a lot more like Manhattan, with people living in close quarters. Assuming people still like to eat on the run, this just would have meant McDonald's would have located in smaller stores. Then again, if not McDonald's then another type of restaurant, either way, we all would likely be much richer. >> those few that have earned profits have taxpayers to thank for providing them the opportunity. >> Instead of subsidizing primarily road and air transportation, balance that out with more pedestrian, bicycle, mass transit and train travel. Why not let the consumer decide how they want to travel, or how much? If people want mass transit, some business will give it to them. If they want more airlines, they will get that to. Businesses are always competing to give consumers what they want, so there is no economic reason government needs to pick the "best" form of transportation. People know what is best for them and if the government stops wasting their money trying to decide for them, they will do just that. you know, i really don't like the idea of banning people from forums/blogs but this is getting ridiculous. i'm sure i'm not the only one who's spending less time at RTH. Other than a few days, traffic has steadily declined since early February. Peter >> i really don't like the idea of banning people from forums/blogs but this is getting ridiculous.